Thailand pulled out of planned ceasefire talks with Cambodia on Wednesday in a setback to efforts to end heavy border fighting that has left 14 people dead, including one civilian. Thai soldiers stand guard along the disputed border. Hopes of a truce had grown after the two countries announced a day earlier that their defence ministers would meet for discussions aimed at ending the bloodiest clashes on their disputed jungle frontier in decades. But Thailand said early Wednesday that its Defence Minister Prawit Wongsuwon would not travel to Cambodia for talks with his counterpart Tea Banh after all. “We decided last night to cancel General Prawit's trip to Phnom Penh today after some Cambodia media reported Thailand agreed to ceasefire talks after it admitted defeat and losses,” army spokesman Colonel Sunsern Kaewkumnerd said. The two nations traded fresh accusations about the breakdown in diplomatic overtures. “Thailand isn't honest about wanting to reach a permanent ceasefire," Cambodian government spokesman Phay Siphan said in Phnom Penh. Eight Cambodian and five Thai troops have died in five days of heavy weapons fire along their shared border, prompting growing diplomatic pressure on the neighbours to end the conflict. 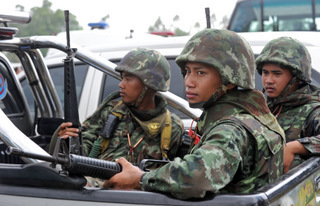 Sunsern said one Thai civilian had also been killed -- the first in the current bout of bloodshed. Both sides have accused each other of starting the clashes. On Tuesday the fighting spread along the border to the 900-year-old Preah Vihear temple, which has been the focus of strained relations between the neighbours since it was granted UN World Heritage status in 2008. That area had been relatively calm for two months and is 150 kilometres (90 miles) east of two other disputed temple complexes that have been the scene of fierce fighting since Friday. In February 10 people were killed near the Preah Vihear temple, prompting a UN appeal for a permanent ceasefire. US Secretary of State Hillary Clinton on Monday urged Thailand and Cambodia to show restraint and said Washington was "deeply concerned". The neighbours agreed in late February to allow observers from Indonesia into the area near Preah Vihear. But the Thai military has since said the monitors are not welcome and they have not been deployed. Thai Foreign Minister Kasit Piromya said on Tuesday that Bangkok would review its policy towards Cambodia including trade, border checkpoints and cooperation at all levels, but would not sever diplomatic ties. Kasit is due to hold talks with Indonesian Foreign Minister Marty Natalegawa, whose country is the current chair of the Association of Southeast Asian Nations regional bloc, on Thursday in Jakarta. "Thailand will inform him that Thailand agrees to international observers but Cambodian troops must withdraw from Preah Vihear," Thai government spokesman Panitan Wattanayagorn said. Tens of thousands of villagers from both sides have fled the recent fighting. Cambodia has accused Thailand of using spy planes and poisonous gas in the recent fighting -- which Bangkok has strongly denied. The fighting comes at a sensitive political time for Thailand, with Prime Minister Abhisit Vejjajiva preparing to dissolve the lower house of parliament soon for elections he has said will be held by early July. Abhisit said on Tuesday that the clashes would not derail his poll plan.